Hildegarde Naughton has set her face against the prevailing blue wind by pledging support to Housing Minister Simon Coveney in the Fine Gael leadership battle, but it is an isolated stance as Galway is overwhelmingly Leo Varadkar country. Almost as soon as Enda Kenny announced he was standing down as FG leader, and the long-running battle between Coveney and Social Protection Minister Varadkar could go overground, Galway FG politicians - like their colleagues across the State - have largely backed the Dubliner over the Corkonian. It says much that the leading Fine Gael politician in County Galway - Galway West TD and Minister for Gaeltacht Affairs and Natural Resources Seán Kyne - pledged his support to Varadkar, saying: "Leo is attentive, focused, and encouraging, and always available to party colleagues and others, who share a strong desire to see our country prosper." He has also praised proposals for the Irish language in Taking Ireland Forward, Varadkar's document outlining his political vision. "The fact these proposals," said Dep Kyne, "include the recognition of the distinct needs of Gaeltacht communities, and a commitment to work for the language rights of Irish speakers, demonstrates Irish will be represented at the highest levels of a government led by Leo Varadkar." Also significant is that city councillor John Walsh, from one of Galway's most staunch FG families - his brother Brian was a TD, their father was a councillor - has also backed Varadkar. "I enthusiastically support Leo and believe he will make an excellent Taoiseach and will continue to be a good friend to Galway," said Cllr Walsh. "As Minister for Health he was a tremendous supporter of our local work to enhance services at Galway Hospice. He also reintroduced the Sports Capital Grants scheme, which has benefitted clubs like Castlegar Hurling Club, St James GAA, Mervue United AFC, and Connacht Rugby." Galway East TD Ciaran Cannon is also backing Varadkar - his Twitter profile features a picture of him with the Dublin TD - while city councillors Pardaic Conneely and Pearce Flannery are also Varadkar supporters. Of the county councillors, Niamh Byrne, Peter Feeney, Aidan Donohue, Michael Finnerty, Jimmy McClearn, Peter Roche, and Joe Byrne, are also backing him. According to party insiders, the mood among the membership is the same. 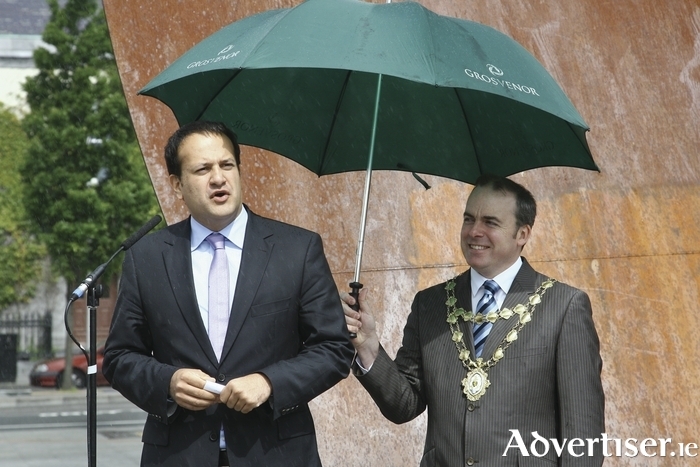 "It is my belief the majority of party membership in the constituency are in the Leo camp," an FG source told the Galway Advertiser this week. Galway support for Coveney is slim, with only Cllr Eileen Mannion and Dep Naughton backing him. Councillors Frank Kearney and Frank Fahy are understood to be undecided. The party will vote for a new leader on Monday. The votes of TDs, senators, and MEPs will account for 65 per cent of the total vote; that of councillors is 10 per cent; while members votes make up 25 per cent. With the level of support for Varadkar high, and his increasing likelihood of becoming, not only the next FG leader, but the next Taoiseach, why, as one of the most prominent FG figures in the county, would Dep Naughton throw her support behind Coveney? Dep Naughton has met with both candidates, but opted for Coveney because of his plans for rebalancing the "continued overdevelopment of the greater Dublin area", as well as for his experience in agriculture, housing, defence, environment and local government, his work in Europe, and "his courage in taking on the housing crisis". A hint though that she knows she has backed the losing candidate may be inferred from her declaration that, "This contest is not over until it’s over" when speaking about party members voting on the leadership. However there are also other reasons, which need to be understood in terms of her career progression to date. Dep Naughton has been a favoured one of the outgoing FG leadership. Her appointment to the Seanad in 2013 was seen as a riposte to then Galway West FG TD Brian Walsh for voting against the Abortion Bill, and unlike Dep Kyne, she has not been an internal critic of Enda Kenny. Her support for Coveney should be no surprise then given he is preferred by the Kenny-Noonan axis over Varadkar. Also, that Dep Kyne was among the first in Galway to go public with his support for Varadkar, would have put Dep Naughton in a difficult position. She could have declared for Varadkar, but it would have given her little or no advantage, because it would be coming after Dep Kyne's declaration, and given the impression of being less enthusiastic than her constituency colleague/rival. More significantly, Dep Kyne is the longer established TD, a junior minister, and unquestionably FG’s 'Man in this Town and County', who looks set to become the FG standard bearer in the coming elections, and the one most feel is likeliest of the two sitting FG TDs to hold a seat. Therefore, if Varadkar becomes Taoiseach, he will more likely to reward the two term junior minister Kyne, rather than the backbench Naughton, who is not even 18 months in the Dáil. As such, Dep Naughton would have seen Covenemy as a better bet given he is the establishment/leadership choice; and, if he wins, she may be able to expect some reward for her support, whereas it is hard to see her accrue any advantage from a Varadkar leadership. Farrell, Cubbard, Keane - the coming generation? Will the UK election be anything other than a Tory landslide?